Being surrounded by nature can conjure an appreciation of natural beauty and inner stillness. Tiny moments may be more readily noticed. 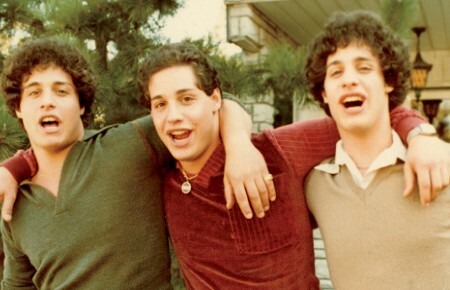 Sometimes, the experience fosters a connection to something bigger than ourselves. Artist Dawn Lee takes her experiences and contemplations from her personal excursions into natural habitats and brings them back to her Sayville studio. There, she channels impressions into her art; like the way energy radiates from moving waters or how plant life can dominate the surroundings. 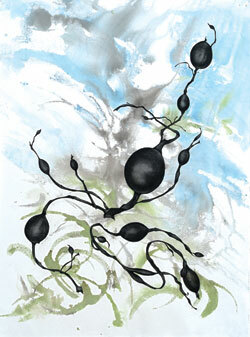 Lee’s art is abstract but her work is recognizable as intimate moments from the natural world. Her compositions invoke the sensation of being surrounded by the setting. This is true whether she’s making paintings, monoprints or drawings. 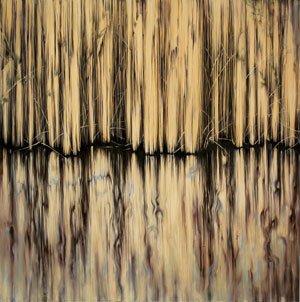 For instance, the Resonance painting series captures wild riverbanks reflected in pale waters. 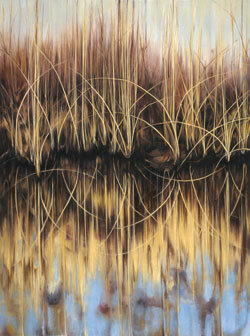 Local grasses and phragmites stand tall and form a commanding space in some paintings. Equally prominent are the reflections cast by the aquatic grasses on still water. In these areas, looser brushstrokes impart a relaxed and even lazy mood contrasting against the solid portrayal of the waterside grasses. In Lee’s art, the viewer feels as if they are just outside the scene, standing nearby, perhaps on a wooded bank looking across the water. This is purposeful, said Lee. The compositions conjure her vantage point while kayaking. Lee frequents the Carmans and Peconic Rivers on Long Island. An avid nature enthusiast, Lee goes on wilderness excursions like backpacking in the Arctic National Wildlife Refuge and kayaking in Alaska with humpback whales. Her last trip into the Alaskan wilderness got her thinking about the way inland water ebbs and flows. Tidal exchanges on Long Island are around two to three feet. In Alaska, she observed exchanges around 15 feet. Contemplating the slower and expansive water motion resulted in a recent series from Shore to Shore; To Here to There. Equally important as the subject matter is Lee’s exploration of “the integrity of form within an environment” and the visual realization of form. The quality of the lines is another important aspect of her work. “Each line is an expression of energy,” she said. Lee’s latest series combines her love of lines with a close-up of nature’s handiwork found in bladderworts, an aquatic plant. The dark plants have “air pots” that cause them to float, Lee said. It also makes them visually interesting. 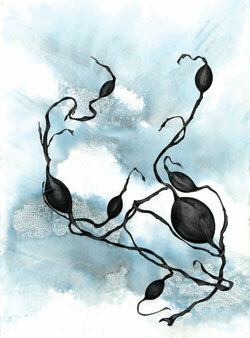 The artworks in this series highlight the bladderwort shapes instead of abstracted landscapes. They also seem to approach portraiture despite the fact the image is part of an abstract work. Bladderworts are selected by Lee to draw. She gravitates towards those with “an awkward grace” that channel beauty of creation in nature. 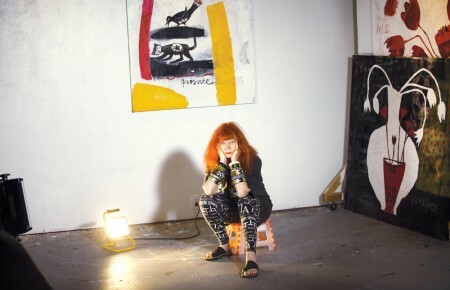 Dawn Lee’s work will be exhibited at three venues in the upcoming months. Her work is the subject of a two-person show at the C2 Gallery in Patchogue from May 5 to May 31. Her work is included in the exhibition, Eastern Shores, at the Hillwood Museum at C.W. Post in Brookville held from June 5 to July 15. Her art will also appear in Marked Differences at the Kentler International Drawing Space in Brooklyn from June 5 to July 24. Lee is Chair of the Art Department at St. Joseph’s College in Patchogue. She is the Director/Curator of the Omni Gallery in Uniondale and is an independent curator. Lee’s work has been shown at the Islip Art Museum, the Alpan Gallery International Invitational, Adelphi University and galleries in New York and Colorado. Lee’s artwork can be viewed online at http://www.dawnleeart.com.